In 1948, Harry Truman was President, a gallon of gas cost 16 cents, and the Pacific Palisades Parade had its debut. Join us on the 4th of July, 2019, at 2:00pm for the 71st Annual Palisades Parade, which has grown to be one of the top Independence Day parades in the entire country. Buy tickets for our reserved covered grandstand seating. Tickets are limited. Tickets Coming Soon! What streets are closed on July 4th in Pacific Palisades? Click here for a list of street closures for the day. 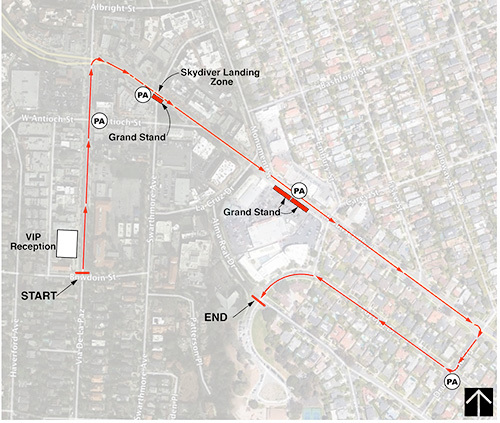 The parade route is shown above. It starts on Via de la Paz, goes up to Sunset Boulevard, follows Sunset until Drummond Avenue, then takes Drummond to Toyopa Drive, and moves along Toyopa until it ends at Alma Real Drive. The reserved seating grandstands are located along the curb at 15120 - 15140 Sunset Blvd., Pacific Palisades, CA 90272. The evening concert and fireworks take place at Palisades Charter High School, 15777 Bowdoin Street, Pacific Palisades. Tickets are required for grandstand seating and Pali High entry. What are my parking options for the events? Parade parking: There is free neighborhood parking off the parade route on a first come, first served basis in areas not designated as "No Parking" or "No Stopping" by the City as long as cars arrive and can access those areas prior to parade street closures going into effect. There are a limited number of VIP parking spots available on a first requested, first served basis for sponsors, invited guests and purchasers of 4 or more grandstand seats in a single transaction. (These limited spots are not available for groups or buses.) Limited paid parking may also be available at Temescal Gateway Park at 15601 Sunset Blvd., at the intersection of Sunset and Temescal Canyon Road. Concert/Fireworks parking: There are a certain number of reserved parking spots at Palisades Charter High School available for pre-purchase, including for patrons with handicapped placards. Parking lot access for the afternoon/evening events starts at 4:00 pm. (This lot is not open for parade parking.) There is free neighborhood parking on a first come, first served basis in nearby areas not designated as "No Parking" or "No Stopping" by the City. Limited paid parking may also be available at Temescal Gateway Park at 15601 Sunset Blvd., at the intersection of Sunset and Temescal Canyon Road. What can I bring into the events? Are there are things I can't bring or do? No dogs or other pets are allowed in the parade grandstands or on the Palisades Charter High School grounds. Smoking, alcoholic beverages and hazardous items are not permitted at either location. All persons and property are subject to search. Patrons are encouraged to bring blankets or folding chairs to sit on the grass to watch the concert and fireworks. There will be some table seating in the food truck area, and patrons may bring their own food and non-alcoholic beverages (no glass bottles please), as long as they collect and properly dispose of all trash and spills in appropriate receptacles. Please contact the organizers via email prior to July 4th with any questions. All events will occur rain or shine. All fireworks ticket-holders must enter by 8:45 pm. GATES WILL CLOSE AT 8:50 PM. There are NO REFUNDS FOR DELAYED ARRIVALS OR FOR NON-USE OF TICKETS. The ticket fee will be deemed to be a donation to the PAPA non-profit that puts on the events if not used for any reason (including being unable to access the grandstands or school after arriving with a pet or after the evening event access gates have closed).